Last Wednesday we attended the best example of off-Broadway theatre in New York City. 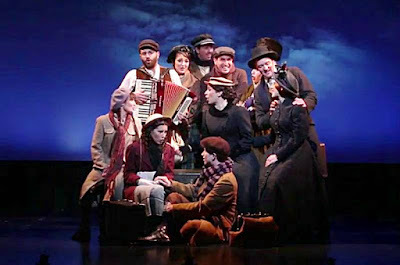 The musical play was Amerike - The Golden Land by Moishe Rosenfeld and Zalmen Mlotek, staged by the National Yiddish Theatre Folksbiene at its new home at the Museum of Jewish Heritage at Manhattan's Battery Park. Amerike is an expanded version of the play that was originally staged in 1982 and updated in 2012. The acting ensemble has grown from six to twelve, and the new play is entirely in Yiddish with English and Russian supertitles. We unearthed gems from Yiddish theater and the folklore that brought these experiences to life in a moving musical chronology. We interlaced the songs with dramatic moments that gave the program a theatrical context. The show includes 41 songs and runs 90 minutes without an intermission. Originally scheduled to run from July 4 through August 6, it has just been extended through August 20. We recommend it highly. Before the hour-and-a-half has elapsed, 12 excellent cast members, directed by Brynna Wasserman (with Merete Muenter covering movement), 41 songs by any number of songwriters float by. There’s much pertinent dialogue written by Moishe Rosenfeld and the always-expert music director Zalmen Mlotek. As the best Manhattan musicals on view these days are listed, Amerike The Golden Land should—and will be—among them.